The only sport associated with Widmerpool these days is Rugby. But it wasn’t always like this: in the mid-20th century Widmerpool really buzzed with different events using its sports field and amenities. Notts County Football Club used it as a training ground, Nottingham Forest Football Club played their youth matches on Sunday mornings. Brian Clough even brought a team of top Division footballers to play in a charity match. Crowds would ring the playing area in deck chairs at weekends to watch top quality sport. Other functions held there included events for the Quorn Hunt, Butchers & Bakers and Young Farmers, Riding for the Disabled, Show Jumping, Weddings, Private Parties and it even acted as a Polling Station. Local people readily helped with events to ensure they were a success, from those on the sports field to the annual Boogaloo Dance held every June for charity. One of the high points involving in Widmerpool (whose side consisted of ex-County players and top local talent), was when they beat Nottinghamshire County Cricket Club one Sunday afternoon in an overs match. This was when Brian Bolus was Captain of Nottinghamshire. Widmerpool was the home of probably one of England’s greatest batsman ever: Reg Simpson, who was reputed to be the best player of fast bowling in the world. Simpson played 366 times for Notts and won 27 England caps. He made a career total of 30,546 runs, including a highest score of 259 for the MCC against New South Wales. He took 69 wickets, including two in Tests, and 193 catches. Simpson hit 1,000 runs in a season 13 times and 2,000 runs in a season five times. He scored ten double centuries. His highest Test score was 159 not out against Australia in Melbourne in the fifth test of the 1950/51 tour. Reg Simpson died on 22nd November 2013, aged 93. Simpson was a stylish opening bat for Nottinghamshire and England. Handsome, tall and dark, he cut an elegant figure at the wicket with his upright stance and flowing drives. A strong back-foot player, he hooked better than most tall men. He bowled occasional off-breaks, and was a fine fielder, especially in the covers. His first-class debut was delayed by the Second World War, and he was first seen playing for Sind in India, where he was stationed with the RAF. 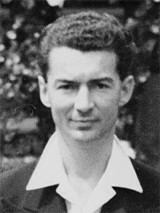 Simpson was 26 before he played first-class cricket in England, but he made an immediate impression, and was selected to tour South Africa in 1948-49. He played a single Test on that tour without passing double figures, but when picked to play against New Zealand the following year he made a century in the middle order. As an opener he found it hard to displace Hutton and Washbrook, and later faced competition from others and was in and out of the Test side over the next six years. In 1951 he took over the captaincy of a weak Nottinghamshire team, and shouldered the burden for the next decade. Intermittent back problems did not prevent him amassing 64 first-class centuries, and playing 27 Tests. Simpson's finest hour was probably the 156* that was a primary contribution to England's first Test victory over Australia in 13 years, in the final game of the 1950-51 tour. Batting at No. 3, he was on 92 when the ninth wicket fell with England only 29 ahead. He took the attack to the Australians magnificently, and the last pair put on 74. EW Swanton said of this innings: "In such a mood Simpson's batsmanship looked akin to greatness". Such moods came upon him rarely however, and he was never able to reproduce the consistency of his county form at Test level. He retired in 1960, served on the Nottinghamshire committee, was made an honorary member of the MCC, and was a director of the bat-makers, Gunn and Moore.